The principles dictating at which stage of maturity a fruit or vegetable should be harvested are crucial to its subsequent storage and marketable life and quality. Post-harvest physiologists distinguish three stages in the life span of fruits and vegetables: maturation, ripening, and senescence. Maturation is indicative of the fruit being ready for harvest. At this point, the edible part of the fruit or vegetable is fully developed in size, although it may not be ready for immediate consumption. Ripening follows or overlaps maturation, rendering the produce edible, as indicated by taste. Senescence is the last stage, characterized by natural degradation of the fruit or vegetable, as in loss of texture, flavour, etc. (senescence ends at the death of the tissue of the fruit). Some typical maturity indexes are described in following sections. This factor is commonly applied to fruits, since skin colour changes as fruit ripens or matures. Some fruits exhibit no perceptible colour change during maturation, depending on the type of fruit or vegetable. Assessment of harvest maturity by skin colour depends on the judgment of the harvester, but colour charts are available for cultivars, such as apples, tomatoes, peaches, chilli peppers, etc. Light transmission properties can be used to measure the degree of maturity of fruits. These methods are based on the chlorophyll content of the fruit, which is reduced during maturation. The fruit is exposed to a bright light, which is then switched off so that the fruit is in total darkness. Next, a sensor measures the amount of light emitted from the fruit, which is proportional to its chlorophyll content and thus its maturity. The shape of fruit can change during maturation and can be used as a characteristic to determine harvest maturity. For instance, a banana becomes more rounded in cross-sections and less angular as it develops on the plant. Mangoes also change shape during maturation. As the mango matures on the tree the relationship between the shoulders of the fruit and the point at which the stalk is attached may change. The shoulders of immature mangoes slope away from the fruit stalk; however, on more mature mangoes the shoulders become level with the point of attachment, and with even more maturity the shoulders may be raised above this point. Changes in the size of a crop while growing are frequently used to determine the time of harvest. For example, partially mature cobs of Zea mays saccharata are marketed as sweet corn, while even less mature and thus smaller cobs are marketed as baby corn. For bananas, the width of individual fingers can be used to determine harvest maturity. Usually a finger is placed midway along the bunch and its maximum width is measured with callipers; this is referred to as the calliper grade. Most fruits synthesize volatile chemicals as they ripen. Such chemicals give fruit its characteristic odour and can be used to determine whether it is ripe or not. These doors may only be detectable by humans when a fruit is completely ripe, and therefore has limited use in commercial situations. Some fruits may develop toxic compounds during ripening, such as ackee tree fruit, which contains toxic levels of hypoglycine. The fruit splits when it is fully mature, revealing black seeds on yellow arils. At this stage, it has been shown to contain minimal amounts of hypoglycine or none at all. This creates a problem in marketing; because the fruit is so mature, it will have a very short post-harvest life. Analysis of hypoglycine A (hyp.) in ackee tree fruit revealed that the seed contained appreciable hyp. at all stages of maturity, at approximately 1000 ppm, while levels in the membrane mirrored those in the arils. This analysis supports earlier observations that unopened or partially opened ackee fruit should not be consumed, whereas fruit that opens naturally to over 15 mm of lobe separation poses little health hazard, provided the seed and membrane portions are removed. These observations agree with those of Brown et al. (1992) who stated that bright red, full sized ackee should never be forced open for human consumption. Leaf quality often determines when fruits and vegetables should be harvested. In root crops, the condition of the leaves can likewise indicate the condition of the crop below ground. For example, if potatoes are to be stored, then the optimum harvest time is soon after the leaves and stems have died. If harvested earlier, the skins will be less resistant to harvesting and handling damage and more prone to storage diseases. As part of the natural development of a fruit an abscission layer is formed in the pedicel. For example, in cantaloupe melons, harvesting before the abscission layer is fully developed results in inferior flavoured fruit, compared to those left on the vine for the full period. A fruit may change in texture during maturation, especially during ripening when it may become rapidly softer. Excessive loss of moisture may also affect the texture of crops. These textural changes are detected by touch, and the harvester may simply be able to gently squeeze the fruit and judge whether the crop can be harvested. Today sophisticated devices have been developed to measure texture in fruits and vegetables, for example, texture analyzers and pressure testers; they are currently available for fruits and vegetables in various forms. 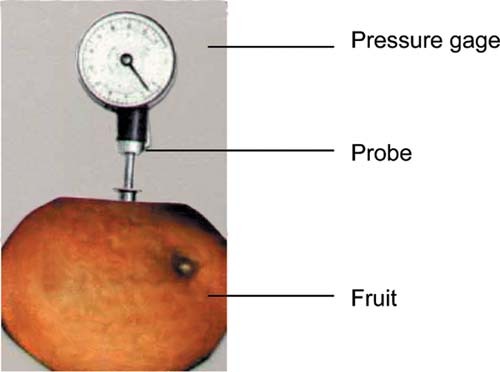 A force is applied to the surface of the fruit, allowing the probe of the penetrometer or texturometer to penetrate the fruit flesh, which then gives a reading on firmness. Hand held pressure testers could give variable results because the basis on which they are used to measure firmness is affected by the angle at which the force is applied. Two commonly used pressure testers to measure the firmness of fruits and vegetables are the Magness-Taylor and UC Fruit Firmness testers (Figure 2.1). A more elaborate test, but not necessarily more effective, uses instruments like the Instron Universal Testing Machine. It is necessary to specify the instrument and all settings used when reporting test pressure values or attempting to set standards. The Agricultural Code of California states that Bartlett pears shall be considered mature if they comply with one of the following: (a) the average pressure test of not less than 10 representative pears for each commercial size in any lot does not exceed 23 lb (10.4 kg); (b) the soluble solids in a sample of juice from not less than 10 representative pears for each commercial size in any lot is not less than 13% (Ryall and Pentzer, 1982). This Code defines minimum maturity for Bartlett pears and is presented in Table 2.1. Table 2.1 Minimum maturity standard (expressed as minimum soluble solids required and maximum Magness-Taylor test pressure allowed) of fresh Bartlett pears for selected pear size ranges (adapted from Ryall and Pentzer, 1982). Figure 2.1 Pressure tester used to measure firmness of fruits and vegetables. The juice content of many fruits increases as the fruit matures on the tree. To measure the juice content of a fruit, a representative sample of fruit is taken and then the juice extracted in a standard and specified manner. The juice volume is related to the original mass of juice, which is proportional to its maturity. The minimum values for citrus juices are presented in Table 2.2. Table 2.2 Minimum juice values for mature citrus. Oil content can be used to determine the maturity of fruits, such as avocados. According to the Agricultural Code in California, avocados at the time of harvest and at any time thereafter, shall not contain in weight less than 8% oil per avocado, excluding skin and seed (Mexican or Guatemalan race cultivars). Thus, the oil content of an avocado is related to moisture content. 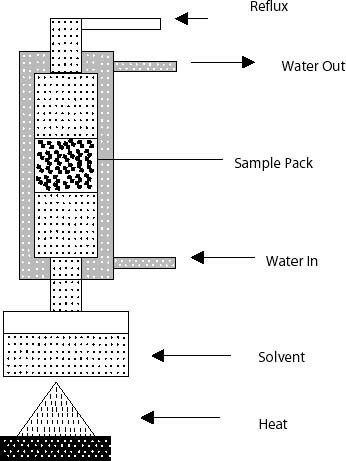 The oil content is determined by weighing 5-10 g of avocado pulp and then extracting the oil with a solvent (e.g., benzene or petroleum ether) in a destillation column. This method has been successful for cultivars naturally high in oil content (Nagy and Shaw, 1980). Figure 2.2 Distillation column used for oil determination. A round flask is used for the solvent. Heat is supplied with an electric plate and water recirculated to maintain a constant temperature during the extraction process (Figure 2.2). Extraction is performed using solvents such as petroleum ether, benzene, diethyl ether, etc., a process that takes between 4-6 h. After the extraction, the oil is recovered from the flask through evaporation of the water at 105°C in an oven until constant weight is achieved. During the development of avocado fruit the oil content increases and moisture content rapidly decreases (Olaeta-Coscorroza and Undurraga-Martinez, 1995). The moisture levels required to obtain good acceptability of a variety of avocados cultivated in Chile are listed in Table 2.3. Table 2.3 Moisture content of avocado fruit cultivated in Chile. In climacteric fruits, carbohydrates accumulate during maturation in the form of starch. As the fruit ripens, starch is broken down into sugar. In non-climacteric fruits, sugar tends to accumulate during maturation. A quick method to measure the amount of sugar present in fruits is with a brix hydrometer or a refractometer. A drop of fruit juice is placed in the sample holder of the refractometer and a reading taken; this is equivalent to the total amount of soluble solids or sugar content. This factor is used in many parts of the world to specify maturity. The soluble solids content of fruit is also determined by shining light on the fruit or vegetable and measuring the amount transmitted. This is a laboratory technique however and might not be suitable for village level production. Measurement of starch content is a reliable technique used to determine maturity in pear cultivars. The method involves cutting the fruit in two and dipping the cut pieces into a solution containing 4% potassium iodide and 1% iodine. The cut surfaces stain to a blue-black colour in places where starch is present. Starch converts into sugar as harvest time approaches. Harvest begins when the samples show that 65-70% of the cut surfaces have turned blue-black. In many fruits, the acidity changes during maturation and ripening, and in the case of citrus and other fruits, acidity reduces progressively as the fruit matures on the tree. Taking samples of such fruits, and extracting the juice and titrating it against a standard alkaline solution, gives a measure that can be related to optimum times of harvest. Normally, acidity is not taken as a measurement of fruit maturity by itself but in relation to soluble solids, giving what is termed the brix: acid ratio. Sanchez et al. (1996) studied the effect of inducing maturity in banana (Musa sp (L.), AAB) Silk fruits with 2-chloroethyl phosphoric acid (ethephon), in some trials in Venezuela. Four treatments (0, 1000, 3000, and 5000 ppm) were applied. The results obtained revealed that the ethephon treatments increased the acidity and total soluble solids. The sucrose formation accelerated while the pH was not affected significantly. On the other hand, the relationship of the Brix/acidity ratio was increased according to the ethephon dose, as presented in Table 2.4. Table 2.4. Effect of ethephon on the maturity index (°Brix/acidity ratio) of banana (manzano) Silk fruits. Means with different letters in a row are significantly different at p<0.05 (Tukey Test). Specific gravity is the relative gravity, or weight of solids or liquids, compared to pure distilled water at 62°F (16.7°C), which is considered unity. Specific gravity is obtained by comparing the weights of equal bulks of other bodies with the weight of water. In practice, the fruit or vegetable is weighed in air, then in pure water. The weight in air divided by the weight in water gives the specific gravity. This will ensure a reliable measure of fruit maturity. As a fruit matures its specific gravity increases. This parameter is rarely used in practice to determine time of harvest, but could be used in cases where development of a suitable sampling technique is possible. It is used however to grade crops according to different maturities at post-harvest. This is done by placing the fruit in a tank of water, wherein those that float are less mature than those that sink. Harvesting containers must be easy to handle for workers picking fruits and vegetables in the field. Many crops are harvested into bags. Harvesting bags with shoulder or waist slings can be used for fruits with firm skins, like citrus fruits and avocados. These containers are made from a variety of materials such as paper, polyethylene film, sisal, hessian or woven polyethylene and are relatively cheap but give little protection to the crop against handling and transport damage. Sacks are commonly used for crops such as potatoes, onions, cassava, and pumpkins. 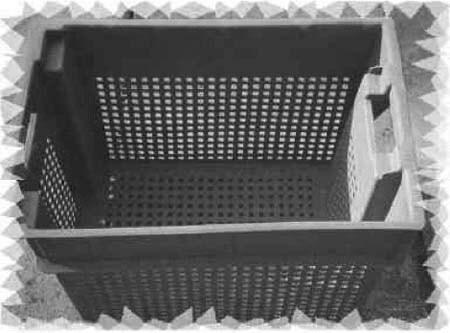 Other types of field harvest containers include baskets, buckets, carts, and plastic crates (Figure 2.3). For high risk products, woven baskets and sacks are not recommended because of the risk of contamination. Figure 2.3 Agricultural apple baskets, pear and corncob carriers. Depending on the type of fruit or vegetable, several devices are employed to harvest produce. Commonly used tools for fruit and vegetable harvesting are secateurs or knives, and hand held or pole mounted picking shears. 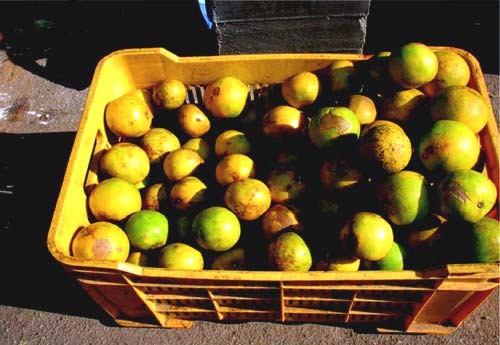 When fruits or vegetables are difficult to catch, such as mangoes or avocados, a cushioning material is placed around the tree to prevent damage to the fruit when dropping from high trees. Harvesting bags with shoulder or waist slings can be used for fruits with firm skins, like citrus and avocados. They are easy to carry and leave both hands free. The contents of the bag are emptied through the bottom into a field container without tipping the bag. Plastic buckets are suitable containers for harvesting fruits that are easily crushed, such as tomatoes. These containers should be smooth without any sharp edges that could damage the produce. Commercial growers use bulk bins with a capacity of 250-500 kg, in which crops such as apples and cabbages are placed, and sent to large-scale packinghouses for selection, grading, and packing. Berries picked for the fresh market (except blueberries and cranberries) are often mechanically harvested and usually packed into shipping containers. Careful harvesting, handling, and transporting of fruits and vegetables to packinghouses are necessary to preserve product quality. Clear polyethylene bags are used to pack banana bunches in the field, which are then transported to the packinghouse by means of mechanical cableways running through the banana plantation. This technique of packaging and transporting bananas reduces damage to the fruit caused by improper handling. These types of boxes are usually made of polyvinyl chloride, polypropylene, or polyethylene. They are durable and can last many years. Many are designed in such a way that they can nest inside each other when empty to facilitate transport, and can stack one on top of the other without crushing the fruit when full (Figure 2.4). Figure 2.4 Plastic field boxes with nest/stack design. These boxes are made of thin pieces of wood bound together with wire. They come in two sizes: the bushel box with a volume of 2200 in3 (36052 cm3) and the half-bushel box. They are advantageous because they can be packed flat and are inexpensive, and thus could be non-returnable. They have the disadvantage of providing little protection from mechanical damage to the produce during transport. Rigid wooden boxes of different capacities are commonly used to transport produce to the packinghouse or to market. (Figure 2.5). 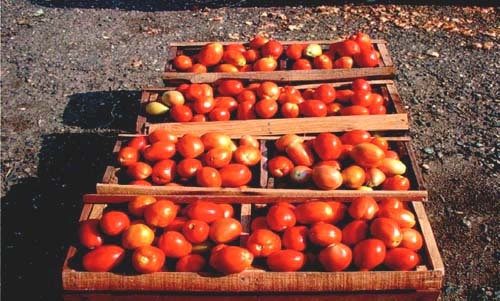 Figure 2.5 Typical wooden crate holding fresh tomatoes. Table 2.5. Approximate depth of bulk bins. When roots and tubers are to be stored for long periods, curing is necessary to extend the shelf life. The curing process involves the application of high temperatures and high relative humidity to the roots and tubers for long periods, in order to heal the skins wounded during harvesting. With this process a new protected layer of cells is formed. Initially the curing process is expensive, but in the long run, it is worthwhile. The conditions for curing roots and tubers are presented in Table 2.6. Table 2.6. Conditions for curing roots and tubers. Curing can be accomplished in the field or in curing structures conditioned for that purpose. Commodities such as yams can be cured in the field by piling them in a partially shaded area. Cut grass or straw can serve as insulating material while covering the pile with canvas, burlap, or woven grass matting. This covering will provide sufficient heat to reach high temperatures and high relative humidity. The stack can be left in this state for up to four days. The fans are used to redistribute the heat to the lower part of the room where the produce is stored. Bulk bins are stacked with a gap of 10 to 15 cm between rows to allow adequate air passage. The system shown in Figure 2.6 can be used for curing onions; an exhaust opening near the ceiling must be provided for air recirculation. Care should be taken to prevent over-dryness of the onion bulbs. When extreme conditions in the field exist, such as heavy rain or flooded terrain, and curing facilities are not available, a temporary tent must be constructed from large tarpaulins or plastic sheets to cure the onions and avoid heavy loss. Heated air is forced into a hollow area at the centre of the produce-filled bins. Several fans are used to recirculate the warm air through the onions while curing. Figure 2.6 Typical curing houses for roots and tubers. Fruits and vegetables are subjected to preliminary treatments designed to improve appearance and maintain quality. These preparatory treatments include cleaning, disinfection, waxing, and adding of colour (some includes brand name stamping on individual fruits). Figure 2.7 Typical produce washing machine. From the washing machine, the fruit passes onto a set of rotary sponge rollers (similar to the rotary brushes). The rotary sponges remove most of the water on the fruit as it is rotated and transported through the sponger. After washing fruits and vegetables, disinfectant agents are added to the soaking tank to avoid propagation of diseases among consecutive batches of produce. In a soaking tank, a typical solution for citrus fruit includes a mixture of various chemicals at specific concentration, pH, and temperature, as well as detergents and water softeners. Sodium-ortho-phenyl-phenate (SOPP) is an effective citrus disinfectant, but requires precise control of conditions in the tank. Concentrations must be kept between 0.05 and 0.15%, with pH at 11.8 and temperature in the range of 43-48°C. Recommended soaking time is 3-5 minutes. Deviation from these recommendations may have disastrous effects on the produce, since the solution will be ineffective if the temperature or concentration is too low (Peleg, 1985). Low concentrations of chlorine solution are also used as disinfectant for many vegetables. The advantage of this solution is that it does not leave a chemical residue on the product. Provides a protective coating over entire surface. Seals small cracks and dents in the rind or skin. Seals off stem scars or base of petiole. Some distributors use ink or stickers to stamp a brand name or logo on each individual fruit. Ink is not permissible in some countries (e.g., Japan), but stickers are acceptable. Automatic machines for dispensing and applying pressure sensitive paper stickers are readily available. The advantage of stickers is that they can be easily peeled off. a) The package must have sufficient mechanical strength to protect the contents during handling, transport, and stacking. b) The packaging material must be free of chemical substances that could transfer to the produce and become toxic to man. c) The package must meet handling and marketing requirements in terms of weight, size, and shape. d) The package should allow rapid cooling of the contents. Furthermore, the permeability of plastic films to respiratory gases could also be important. e) Mechanical strength of the package should be largely unaffected by moisture content (when wet) or high humidity conditions. f) The security of the package or ease of opening and closing might be important in some marketing situations. g) The package must either exclude light or be transparent. h) The package should be appropriate for retail presentations. i) The package should be designed for ease of disposal, re-use, or recycling. j) Cost of the package in relation to value and the extent of contents protection required should be as low as possible. Baskets made of woven strips of leaves, bamboo, plastic, etc. Nets are only suitable for hard produce such as coconuts and root crops (potatoes, onions, yams). Wooden crates are typically wire bound crates used for citrus fruits and potatoes, or wooden field crates used for softer produce like tomatoes. Wooden crates are resistant to weather and more efficient for large fruits, such as watermelons and other melons, and generally have good ventilation. Disadvantages are that rough surfaces and splinters can cause damage to the produce, they can retain undesirable odours when painted, and raw wood can easily become contaminated with moulds. Fibreboard boxes are used for tomato, cucumber, and ginger transport. They are easy to handle, light weight, come in different sizes, and come in a variety of colours that can make produce more attractive to consumers. They have some disadvantages, such as the effect of high humidity, which can weaken the box; neither are they waterproof, so wet products would need to be dried before packaging. These boxes are often of lower strength compared to wooden or plastic crates, although multiple thickness trays are very widely used. They can come flat packed with ventilation holes and grab handles, making a cheap attractive alternative that is very popular. Care should be taken that holes on the surface (top and sides) of the box allow adequate ventilation for the produce and prevent heat generation, which can cause rapid product deterioration. Plastic crates are expensive but last longer than wooden or carton crates. They are easy to clean due to their smooth surface and are hard in strength, giving protection to products. Plastic crates (Figure 2.8) can be used many times, reducing the cost of transport. They are available in different sizes and colours and are resistant to adverse weather conditions. However, plastic crates can damage some soft produce due to their hard surfaces, thus liners are recommended when using such crates. Pallet boxes are very efficient for transporting produce from the field to the packinghouse or for handling produce in the packinghouse. Pallet boxes have a standard floor size (1200 × 1000 mm) and depending on the commodity have standard heights. Advantages of the pallet box are that it reduces the labour and cost of loading, filling, and unloading; reduces space for storage; and increases speed of mechanical harvest. The major disadvantage is that the return volume of most pallet boxes is the same as the full load. Higher investment is also required for the forklift truck, trailer, and handling systems to empty the boxes. They are not affordable to small producers because of high, initial capital investment. Figure 2.8 Typical plastic crate holding fresh oranges. Fruit is precooled when its temperature is reduced from 3 to 6°C (5 to 10°F) and is cool enough for safe transport. Precooling may be done with cold air, cold water (hydrocooling), direct contact with ice, or by evaporation of water from the product under a partial vacuum (vacuum cooling). A combination of cooled air and water in the form of a mist called hyraircooling is an innovation in cooling of vegetables. Precooling of fruits with cold air is the most common practice. It can be done in refrigerator cars, storage rooms, tunnels, or forced air-coolers (air is forced to pass through the container via baffles and pressure differences). Ice is commonly added to boxes of produce by placing a layer of crushed ice directly on the top of the crop. An ice slurry can be applied in the following proportion: 60% finely crushed ice, 40% water, and 0.1% sodium chloride to lower the melting point. The water to ice ratio may vary from 1:1 to 1:4. This method involves placing the crop in cold storage. The type of room used may vary, but generally consists of a refrigeration unit in which cold air is passed through a fan. The circulation may be such that air is blown across the top of the room and falls through the crop by convection. The main advantage is cost because no specific facility is required. The principle behind this type of precooling is to place the crop into a room where cold air is directed through the crop after flowing over various refrigerated metal coils or pipes. Forced air-cooling systems blow air at a high velocity leading to desiccation of the crop. To minimize this effect, various methods of humidifying the cooling air have been designed such as blowing the air through cold water sprays. The transmission of heat from a solid to a liquid is faster than the transmission of heat from a solid to a gas. Therefore, cooling of crops with cooled water can occur quickly and results in zero loss of weight. To achieve high performance, the crop is submerged in cold water, which is constantly circulated through a heat exchanger. When crops are transported around the packhouse in water, the transport can incorporate a hydrocooler. This system has the advantage wherein the speed of the conveyer can be adjusted to the time required to cool the produce. Hydrocooling has a further advantage over other precooling methods in that it can help clean the produce. Chlorinated water can be used to avoid spoilage of the crop. Hydrocooling is commonly used for vegetables, such as asparagus, celery, sweet corn, radishes, and carrots, but it is seldom used for fruits. Cooling in this case is achieved with the latent heat of vaporization rather than conduction. At normal air pressure (760 mmHg) water will boil at 100°C. As air pressure is reduced so is the boiling point of water, and at 4.6 mmHg water boils at 0°C. For every 5 or 6°C reduction in temperature, under these conditions, the crop loses about 1% of its weight (Barger, 1961). This weight loss may be minimized by spraying the produce with water either before enclosing it in the vacuum chamber or towards the end of the vacuum cooling operation (hydrovacuum cooling). The speed and effectiveness of cooling is related to the ratio between the mass of the crop and its surface area. This method is particularly suitable for leaf crops such as lettuce. Crops like tomatoes having a relatively thick wax cuticle are not suitable for vacuum cooling. There is no ideal storage for all fruits and vegetables, because their response to reduced temperatures varies widely. The importance of factors such as mould growth and chilling injuries must be taken into account, as well as the required length of storage (Wills et al., 1989). Storage temperature for fruits and vegetables can range from -1 to 13°C, depending on their perishability. Extremely perishable fruits such as apricots, berries, cherries, figs, watermelons can be stored at -1 to 4°C for 1-5 weeks; less perishable fruits such as mandarin, nectarine, ripe or green pineapple can be stored at 5-9°C for 2-5 weeks; bananas at 10°C for 1-2 weeks and green bananas at 13°C for 1-2 weeks. Highly perishable vegetables can be stored up to 4 weeks such as asparagus, beans, broccoli, and Brussels sprouts at -1-4°C for 1-4 weeks; cauliflower at 5-9°C for 2-4 weeks. Green tomato is less perishable and can be stored at 10°C for 3-6 weeks and non-perishable vegetables such as carrots, onions, potatoes and parsnips can be stored at 5-9°C for 12-28 weeks. Similarly, sweet potatoes can be stored at 10°C for 16-24 weeks. The storage life of produce is highly variable and related to the respiration rate; there is an inverse relation between respiration rate and storage life in that produce with low respiration generally keeps longer. For example, the respiration rate of a very perishable fruit like ripe banana is 200 mL CO2.kg-1h-1 at 15°C, compared to a non-perishable fruit such as apple, which has a respiration rate of 25 mL CO2.kg-1 h-1 at 15°C. Exposure of fruits and vegetables to high temperatures during post-harvest reduces their storage or marketable life. This is because as living material, their metabolic rate is normally higher with higher temperatures. High temperature treatments are beneficial in curing root crops, drying bulb crops, and controlling diseases and pests in some fruits. Many fruits are exposed to high temperatures in combination with ethylene (or another suitable gas) to initiate or improve ripening or skin colour. In situ. This method of storing fruits and vegetables involves delaying the harvest until the crop is required. It can be used in some cases with root crops, such as cassava, but means that the land on which the crop was grown will remain occupied and a new crop cannot be planted. In colder climates, the crop may be exposed to freezing and chilling injury. Sand or coir: This storage technique is used in countries like India to store potatoes for longer periods of time, which involves covering the commodity under ground with sand. Pits or trenches are dug at the edges of the field where the crop has been grown. Usually pits are placed at the highest point in the field, especially in regions of high rainfall. The pit or trench is lined with straw or other organic material and filled with the crop being stored, then covered with a layer of organic material followed by a layer of soil. Holes are created with straw at the top to allow for air ventilation, as lack of ventilation may cause problems with rotting of the crop. Clamps. This has been a traditional method for storing potatoes in some parts of the world, such as Great Britain. A common design uses an area of land at the side of the field. The width of the clamp is about 1 to 2.5 m. The dimensions are marked out and the potatoes piled on the ground in an elongated conical heap. Sometimes straw is laid on the soil before the potatoes. The central height of the heap depends on its angle of repose, which is about one third the width of the clump. At the top, straw is bent over the ridge so that rain will tend to run off the structure. Straw thickness should be from 15-25 cm when compressed. After two weeks, the clamp is covered with soil to a depth of 15-20 cm, but this may vary depending on the climate. Windbreaks are constructed by driving wooden stakes into the ground in two parallel rows about 1 m apart. A wooden platform is built between the stakes about 30 cm from the ground, often made from wooden boxes. Chicken wire is affixed between the stakes and across both ends of the windbreak. This method is used in Britain to store onions (Thompson, 1996). Cellars. These underground or partly underground rooms are often beneath a house. This location has good insulation, providing cooling in warm ambient conditions and protection from excessively low temperatures in cold climates. Cellars have traditionally been used at domestic scale in Britain to store apples, cabbages, onions, and potatoes during winter. Barns. A barn is a farm building for sheltering, processing, and storing agricultural products, animals, and implements. Although there is no precise scale or measure for the type or size of the building, the term barn is usually reserved for the largest or most important structure on any particular farm. Smaller or minor agricultural buildings are often labelled sheds or outbuildings and are normally used to house smaller implements or activities. Evaporative cooling. When water evaporates from the liquid phase into the vapour phase energy is required. This principle can be used to cool stores by first passing the air introduced into the storage room through a pad of water. The degree of cooling depends on the original humidity of the air and the efficiency of the evaporating surface. If the ambient air has low humidity and is humidified to around 100% RH, then a large reduction in temperature will be achieved. This can provide cool moist conditions during storage. Night ventilation. In hot climates, the variation between day and night temperatures can be used to keep stores cool. The storage room should be well insulated when the crop is placed inside. A fan is built into the store room, which is switched on when the outside temperature at night becomes lower than the temperature within. The fan switches off when the temperatures equalize. The fan is controlled by a differential thermostat, which constantly compares the outside air temperature with the internal storage temperature. This method is used to store bulk onions. Controlled atmospheres are made of gastight chambers with insulated walls, ceiling, and floor. They are increasingly common for fruit storage at larger scale. Depending on the species and variety, various blends of O2, CO2, and N2 are required. Low content O2 atmospheres (0.8 to 1.5%), called ULO (Ultra -Low Oxygen) atmospheres, are used for fruits with long storage lives (e.g., apples). Table 2.7. Recommended conditions for hot water and fungicide treatments. Fruit and vegetable decay is also caused by storage conditions. Too low temperatures can cause injury during refrigeration of fruits and vegetables. High temperatures can cause softening of tissues and promote bacterial diseases. The damage that microorganisms inflict on fresh fruits and vegetables is mainly in the physical loss of edible matter, which may be partial or total.